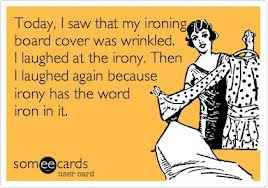 Family Trees May Contain Nuts: DID I MENTION I HATE IRONING? The funniest thing is that I still didn't do any ironing. I don't know why I dislike it so. I love crisp lines and smoothly ironed clothes. I love the smell of the steamy fabric. Love it so much you do it for fun. Hate it so much you live in a nudist colony? I iron, but never thought about the ironing board cover and wrinkles!! I haven't ironed for so long I'll have to put the clothes pile waiting to be ironed in the dryer to blow the dust off them. The ironing is all mine (except for the church linens) because I like crisp cotton shirts. I guess that's testimony that I have way too many clothes if I haven't missed those shirts. It's just one of those 'it is what it is' things. There are no fatal consequences if you don't do it. 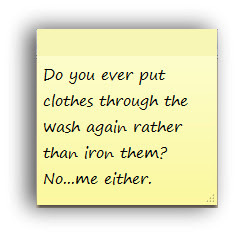 I rather enjoy ironing...but then again I haven't done it for ages...so I guess that's why. I stopped using water in my iron, what a difference that makes. well...I do like ironing vintage linens for the booth or for sewing ...and I do have to iron some clothes. Its not the worse job, and I kind of zone out when I am doing it! Have a fabulous Canada Day weekend! I love ironing - sometimes to cheer myself up on a gloomy day I will get out all my vintage linens - and they are many - and re-iron and fold them. It just cheers me so - and the linen closet is tidied up. I ironed a lot when I was a kid - my dad was a school teacher and he wore two, maybe three clean, white, long sleeved shirts a day - that adds up fast. I never minded ironing them, it gave me some quiet time in a house of commotion. Must confess, I am not a big fan of ironing. I closed down my linen business of many years....you can only imagine how much linen I would have to press off...after I got them professionally cleaned! When they went on the tables, they had to be perfect.